Born and bred in Kathmandu, Nepal, Abhisek Bhadra started his musical career in the local jazz and rock scene. Along with his past projects, He won the Rockheads competition and Jazzmandu Jazz for the next generation competition very early in his music career in 2005 and also bagged “The most outstanding musician Award” in the same competition in 2010. During these years Abhisek composed/arranged and played piano and keyboards for local bands like JCS quartet, Jindabaad, All my friends, Cadenza collective to name a few. 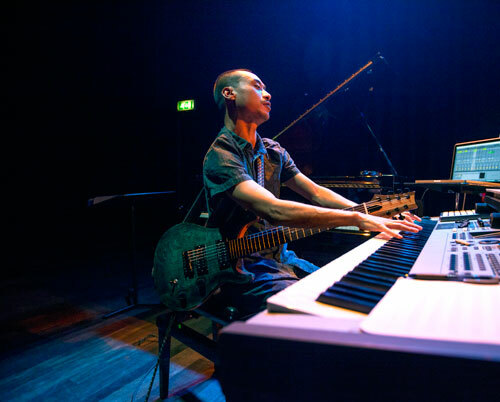 In 2012 he moved to Rotterdam, Netherlands to pursue a Bachelor in Jazz Composition/Arranging in Codarts, Rotterdam Conservatorium. Since then his eclectic approach to music has lead him to play and write for bands like Voodrish and Dichter at venues such as Paradiso Amsterdam, Splendor Amsterdam, De Doelen Rotterdam, Amsterdam Concertgebouw and national TV/ Radio shows like DWDD, and 3VOOR12. He has also composed and arranged for established ensembles like the Jazz Orchestra of the Concertgebouw under the supervision of Dennis Mackrel(Vanguard Jazz Orchestra and the Count Basie Orchestra), Decaphonics and AKOM ensemble. At the same time he has tried his hands on electronic music by venturing through diverse fields such as contemporary electro-acoustic music to mainstream hip-hop.